George Graham Reviews Jeff Beck's "Emotion and Commotion"
But now at age 65, he is out with a new CD called Emotion & Commotion, which is one of his most musically ambitious to date, and fully on the par with Blow by Blow. Like the latter, there is a prominent orchestra, and this CD has a somewhat varied cast of musical characters, with different drummers and bassists, plus three very different guest women vocalists, including young pop-soul singer Joss Stone, and an opera vocalist Gloria Safe. Beck's most frequent collaborators on the new CD are keyboard man Jason Rebello and orchestral arranger Pete Murray. The material is an interesting mix -- there are two classical pieces, including a Puccini aria, and two pieces that were recorded by the late singer-songwriter Jeff Buckley -- neither of which were Buckley compositions -- a version of Over the Rainbow, plus some originals, some written with or by Rebello. Beck's guitar work is quite tasteful and often understated. Beck can be a guitar flash when we wants, but among the elders of rock guitar, he has always managed to say a lot with relatively few notes. And his electric guitar tone on this CD is also a nice match for the musical contexts in which he plays, including the orchestra. Like Blow by Blow 35 years ago, the tracks on Emotion & Commotion flow together and overlap some, which is a wonderful way of thwarting those who would deconstruct the album into tunes to be downloaded. This is one of those concept albums like the days of yore when people actually had some kind of attention span. Those of a certain generation may cringe a bit at the thought that here is a rock icon who has reached what used to be considered retirement age. But Jeff Beck is has probably been more active in the last year or so than many artists half his age. He won another Grammy for rock instrumental recording, he was inducted into the Rock and Roll Hall of Fame for a second time last year, and he is on a tour with another Yardbirds veteran, Eric Clapton. He'll be embarking on a worldwide tour to support this CD as well. Lean, athletic and fully hirsute, he also still looks the part of the rocker. But besides all of that, on his relatively short 40 minute CD, Jeff Beck has made what I think could be the best album of his 45 year career. It's on the level of his classic recording Blow by Blow but I think the musicianship and the arranging are better. And, it's wonderfully eclectic and yet tasteful, cramming a great musical journey into that 40 minutes. Sonically, we'll also give the CD a rare unrestricted grade "A". The guitar sound is sumptuous, the orchestra is just the right blend of atmospherics and acoustic sound, and the recording actually has a wide dynamic range. The music can start out very soft but when the cranked-up rock material comes in, it has lots of impact. Some rockers don't age well musically, either getting stuck in the past plying the oldies circuit, or trying unsuccessfully to be trendy. 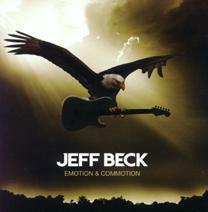 Jeff Beck may be 65 years old, but he's definitely at the top of his form on his new CD Emotion and Commotion.